Which is more fun – the one-trick-pony device that does one fun thing well, or the device you can use for many types of entertainment? In India, the most-preferred connected device for fun is a Smartphone or Basic feature phone. Connected adults in India find more ways than those in other countries to entertain themselves with their Mobile Phones. Their breadth of entertainment activities is greater than with their PCs or Tablets. This is based on our most recent wave of research – the MetaFacts Technology User Profile (TUP) 2017 edition. Unlike Connected Adults around the world in other countries, in India, Smartphones are used for a unique set of Entertainment Activities. Well more than half of India’s Connected Adults use their Smartphones for music and movies. Watching videos/movies and listening to music on one’s Smartphone are regular activities at more than a third higher share of Connected Adults. In contrast, when Germans use their connected devices for Entertainment Activities, they prefer their PCs. And when they use their PCs for Entertainment, most Germans use a PC to play a game (39% of Connected Adults), Hobbies (38%), and to watch videos/movies (37%). Very practical, those Germans, to use the larger screens of PCs. Tablets have yet to make their way as being the most-entertaining connected device. Although Tablets are growing in regular use throughout the world, only in the U.S. and U.K. do they account for more than one-tenth of the preferred entertainment device. Entertainment continues to remain one of the reasons why people use connected devices. As both wired and wireless networks continue to expand their speed, this has made for more enjoyable experiences, especially for bandwidth-hogging activities such as watching movies or television. Similarly, as wireless carriers such as T-Mobile in the U.S. have removed or reduced data caps, this has reduced barriers for many customers. Consequently, these types of entertainment activities have reached a broader swath of consumers. Consumers continue to be the leading innovators in finding ways to get to the content they want, meaning they’ll consider moving beyond the devices they’re using today. This MetaFAQ is based on TUP 2017 WW table 580 ACT_ENTxCOUNTRY – Entertainment Activities by Country. This is based on our most recent research among 13,572 US adults as part of the Technology User Profile (TUP) 2017 survey. This MetaFAQs research result addresses one of the many questions profiling active technology users. Many other related research answers are part of the TUP service, available to paid subscribers. The TUP sections with the most information about Notebook/Laptop PC use by country is the Technology User Profile Chapter. These MetaFAQs are brought to you by MetaFacts, based on research results from their most-recent wave of Technology User Profile (TUP). For more information about MetaFacts and subscribing to TUP, please contact MetaFacts. How many years do consumers use their Notebook PCs? Based on our MetaFacts Technology User Profile (TUP) 2017 survey, the average is 3.1 years around the world. In the US, the average is a full half year newer, at 2.6 years. Among the world’s leading economies, Germans use their notebooks PCs for longer than Americans or Brits. Among Germans, nearly one in four (24%) of actively used notebooks were in acquired in 2012 or earlier, more than 4.5 years old. By contrast, in the US and UK, only 15% or fewer of laptops are this old. Those who watch consumer buying patterns and recycling initiatives and actions may not be surprised at this. Americans tend towards buying new replacements for many products. Germans are known for buying goods with a focus on long-term use as well as limiting environmental impacts. 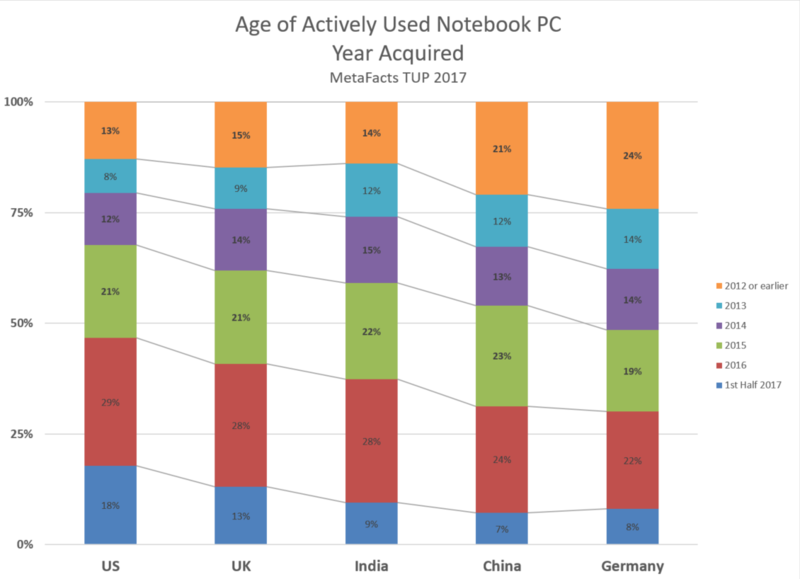 This MetaFAQ is based on TUP 2017 WW table 320 NOTExCOUNTRY – Notebook PCs by Country. This is based on our most recent research among 13,572 US adults as part of the Technology User Profile (TUP) 2017 survey. It can be exciting to see the hockey-stick charts, with everything up and to the right. It’s important to put the numbers into context, though, through a more grounded analysis of the active installed base. Yes, Apple’s long-climb into broader use of their triumvirate is substantial, Smartphones are quickly replacing basic cell phones, and PCs and Printers persist. Their market size confirms their importance. We humans are wired to notice change. Our very eyes send more information about motion than background. While life-saving should tigers head our way, this capability can be our undoing if we miss gradual changes, like the slithering snake in the grass creeping towards us. Watching an installed base of technology has some parallels. For some, it can seem as if nothing is really changing even while important shifts are taking place. For over 35 years, I have tracked technology usage trends and profiles, all calibrated by watching customers through surveys such as our Metafacts Technology User Profile. Among other truisms, I’ve seen that true technology trends aren’t sudden. Solid trends are the summation of the habits, preferences, and activities of millions of technology users. They’re inescapable, inexorable, and years in the making. Trends become truly important when they’ve spread beyond being a niche, fad, or fizzle, and reached beyond those first few early adopters. Primacy. The first device you reach for, the one you stay near, the one you rely on. You might think that it’s the Smartphone, and that’s correct for many, but not all. For many activities and market segments, PCs and tablets dominate. A user’s activity focus affects which devices they choose most often, as does their operating system collection, among other factors. All-Apple and all-Windows users are living in different worlds – as they have strikingly different preferences for their primary devices. Among Apple-only users, Smartphones are the primary device for most types of activities. The PC (Mac or MacBook in this case) is their primary device for cloud storage/sharing and for search and information-related activities. Half (50%) of these adults using only Apple iOS or MacOS devices (no Microsoft Windows or Google Android or ChromeOS) do most of their cloud storage/sharing activities on a PC, and just under one-third (32%) primarily use a Smartphone. In contrast, among Windows-only users, the PC is strongly the primary device for every major type of activity. Smartphones are only ranked second for productivity/personal and graphics/images activities. A tablet is the second choice for the greatest number of activity types – cloud storage/sharing, search/information, shopping, and social networking. Apple’s iPad doesn’t rank as a second device for any type of activity among Apple-only users. This low level of primacy may seem surprising given that penetration of iPads is higher than average among this Apple-loyal segment. Sixty-one percent of Apple-only users regularly use an Apple iPad, more than double the national rate of 29%. This primacy analysis doesn’t mean Apple-only users aren’t enjoying their iPads – simply that they’re lower on the list of devices they choose for a wide range of activities. Across the entire base of connected adults, the PC is the leader for nearly every type of activity. The Swiss Army Knife broad nature of PCs continues its appeal. Smartphones only lead PCs for communications and graphics/imaging activities. Many of the specific activities in these two categories are strongly mobile – making phone calls, staying in touch, and taking and sharing photos. Connected Devices are dominated by three operating systems families – Microsoft Windows, Apple’s MacOS and iOS, and Google’s Android and Chrome OS. The base of Windows, once exclusively dominant, is well-overlapped by Apple and Google. The majority of users are living a multi-OS lifestyle, juggling more than OS family. The two largest OS combinations are nearly equal in market size. Just over one-fourth (26%) of users use connected devices running Windows and Google, and none with an Apple OS. Another fourth (25%) have Windows and Apple devices, with none as Google. It might be assumed that Apple-only users are early adopters while Windows-only users are laggards, partly explaining why they might choose different devices as primary or secondary. This is only partly true. The Windows-only users do include many tech laggards and the late majority, with 38% being the last of their age group to have first used a PC, mobile phone, or tablet. However, the Apple-only users aren’t especially early adopters, as 32% meet that definition, which is slightly less than the 33% nationwide who also do. There are other characteristics that set them apart. Windows-only users are the oldest of the major OS family groups, on average 10 years older than every other group. They also include the smallest share of full-time employees, highest share of low-income households, and lowest average number of devices. Apple-only users have the highest share of younger millennials, have relatively high incomes, although are middling with respect to tech early adopters and laggards. The jugglers of all three OS are the youngest, high incomes, more devices in use, and have the highest share of tech early adopters. Primacy of device by activity also varies with respect to the user’s age and consumer tech spending on devices and services. Younger adults aren’t necessarily the biggest tech spenders, nor are Smartphone users. In fact, those who primarily use their PCs for social networking or image/graphics activities are the biggest tech spenders and older than those who mostly use Smartphones for those activities. The average age of adults who use a PC for the majority of their image/graphics activities – from managing photos to creating presentations – is 44, nearly five years older than those whose primary image/graphics device is a Smartphone. The graphics PC group also spends more than $1,450 per year more than Smartphone-focused users. Similarly, PC-focused Social Networkers are more than 8 years older and spend $730 more per year on consumer tech devices and services than their Smartphone counterparts. We expect tablets to continue to languish as a minor device for most users and most activity categories. As more 2-in-1 and convertible notebooks emerge and grow in acceptance, they will continue to relegate tablets to secondary or tertiary use. Smartphones will continue their market penetration, replacing the basic cell phone among the last stalwart holdouts. Whether the last new Smartphone adopters will choose to go with Android or Apple Smartphones will set them on a course strongly affecting their next PC and tablet purchase. It’s most likely they will choose Google Android since this segment is more price-sensitive and less tech-savvy than average. PCs will continue their gradual decline from primacy, to be replaced by Smartphones. Within PCs, there will be a broader division between the activity profiles for desktop and mobile PCs. We expect desktop PCs to continue their broad primary and secondary use, due to inertia and the as yet unmatched broad capabilities of PCs. Mobile PCs, however, while pressuring tablets, will themselves feel the strongest pressure from Smartphones as their broad usefulness continues to expand. This TUPdate includes a complimentary brief summary of recent MetaFacts TUP (Technology User Profile) research results. These results are based on the most-recent results of the MetaFacts Technology User Profile 2016 survey, its 34th wave, with 7,334 respondents (US). For more information about MetaFacts and subscribing to TUP, please contact MetaFacts. Current TUP subscribers can tap into any of the following TUP information used for this analysis or for even deeper analysis. This TUPdate is based on the TUP Life Stage section, which is within the TUP 2016 User Profile Chapter. Some tech products seem to be on everyone’s shopping list, and yet that’s not really the case. Well, certainly smartphones and mobile PCs rank near the top, as they have for years. However, several highly-publicized products haven’t ranked in the top 20 while other less-acclaimed standbys continue to rank well. Smartwatches by anyone except Apple or Google? Home Thermostats? Chromebooks? They’re not in the top 20, languishing along with basic feature phones. Only a small number of tech buyers are showing true interest. Diving into the purchase plans from our most recent wave of Technology User Profile (TUP 2016), we’ve identified some very interesting patterns. What are the top-planned tech products? Smartphones top the list of purchase plans, with the majority being among those who already use a smartphone. Gaming PCs are strong, with Gaming Desktop PCs drawing nearly triple the interest of Gaming Notebook PCs. Traditional Notebooks continue to rank strongly, while other mobile PC plans are split between 2-in-1 and convertible designs. Fitness trackers show promise, handily outranking plans for smartwatches by Apple, Google, or any of the many languishing others. Two products continuing to show steady demand are the venerable Printer and Tower Desktop. Both continue to be ranked in the top 10 for interest. Apple’s iPad continues to show solid interest, benefiting from recent product refreshes. Plans for Android tablets, however, don’t measure up to Apple’s. What’s interesting is that most tech plans are not evenly spread across all technology users, and instead several key segments have plans that stand out from the pack. One simple difference between those planning and those not planning – age. Tech purchase plans are stronger among younger than older adults. Younger adults have stronger plans to purchase any of the 30 tech products we surveyed respondents about. Adults age 30-34 are the peak group with overall purchase plans, with 77% planning to buy at least one product in the coming year. At the other end of the age spectrum, adults age 70 or above are the nadir group with respect to purchase plans, with 29% planning to buy any of the surveyed tech products. A summation analysis reveals stronger purchase intensity among younger than older adults. The sigma – summation of the plans for all of the respective tech products – shows that adults age 30-39 have the strongest plans of any age group. This is a more intensive curve than the above penetration analysis, reflecting the much broader range of plans among younger adults. Six tech products stand out for being age-skewed – with the largest differences between plans among older and younger adults. Gaming Desktop PCs are at the top of the list, with respect to the widest difference between those with and without plans by age groups. It’s not as if these tricked-out desktops are only pulled towards the youngest among us. The group with the strongest plans are adults age 30-34, which reflects in part that these older adults have the means to pay for these more-powerful PCs. It is also due in part that older adults have more PC usage and experience, with productivity activities as in game planning. Smartphones – both Apple iPhones and Androids – are more popular with younger than older adults. Since younger adults have higher penetration of smartphone usage than older adults, this reflects a strong replacement market. Conversely, low interest levels also reflects a low likelihood for the smartphone market to strengthen its penetration among older adults. PC purchase intentions are strongest among age 35-39 adults for more than one PC form factor. This reflects the desire for expanded PC use among this important segment, and also this group’s openness to have PCs which are packaged in different formats. There’s something for everybody. Each age group has its preferences, with some products at the top of mind of nearly every age group. While looking at the top three ranked products within each age group, we found some interesting patterns. Apple’s iPhone is singular because it’s top-ranked in all groups – in the top three for all 11 age groups. Android Smartphones aren’t very far behind, being top-ranked in 9 groups. That the two oldest groups didn’t report Android Smartphones on their future purchase list may be due in part to the phone or carrier brand having stronger recognition than the Google Android operating system. Three tech products are strongest among generally older groups – traditional notebooks, printers, and fitness trackers. That 7 of the 11 age groups rank traditional notebooks in the top of their shopping list bodes well for the venerable PC. Although wearables such as Apple’s Watch and Google Wear have garnered much media attention, neither are in the top three for any age group. One wearable is, though, and it’s fitness trackers. Despite advertising often featuring slim younger women in yoga pants, fitness trackers only rank among the top three items for adults who are age 70 and above. This category is partly an example of aspirational marketing, appealing to those who want to be something they aren’t (yet). Six tech products stand out based on analysis of consumer tech spending by quartiles. Top spenders – those in the top 1/4th of total household tech spending – are above average in their purchase plans for nearly every tech product. What’s interesting are the tech products which have captured above average interest among the next tier of buyers – those that are in the 3nd-highest quartile of total tech spending. Within this spending segment, the six tech products which show above-average plans include three Apple products, three wearables, and a fun-oriented category. The uniquely-strong products from Apple include the iPhone, iPad, and Watch. Apple’s regular product line refresh has helped keep interest high. Interestingly, interest for fitness trackers outpaces smartwatches, even among the biggest spenders. This supports, in part, the notion that cost would be a primary barrier to smartwatch adoption. Even more so, it reflects the early stage wearables have in the user’s device collection. There is still plenty of experimentation ahead, as entrants come and go, as ecosystems flower and fade, and mostly as more mainstream users integrate wearable devices into their regular activities. Our research continues to show that future tech purchases are strongly affected by consumer’s current products. Two device combinations stand out as those with the strongest tech purchase plans. Users with a desktop, notebook, mobile, and a tablet make up 31% of connected adults, and those with a notebook, tablet, and mobile phone are 10% of adults. Users with other combinations have tech purchase plans below average. Five tech products stand out by having stronger-than-average plans among these two popular combos. The Apple iPhone tops the list, with 13% of all connected adults planning to buy one. For those with all four devices – desktop, notebook, tablet, and mobile phone – 19% plan to get an Apple iPhone, well above the average. Those juggling three devices – notebook, tablet, and mobile phone – are also above average in planning to get an Apple iPhone, with 16% planning to get one. Purchase plans for traditional notebooks are also strong, and in this case strongest among this 2nd-ranked combination, representing an additional or replacement notebook for 13% of adults. Plans for the largest combination segment are also stronger than average, at 11% of these adults. Other above tech products for both of these device-combination segments include a Fitness Tracker such as a FitBit, an Apple iPad, and an Android Tablet. Looking ahead, we expect the tech-device-rich to get tech-richer, with those who have the broadest collection of technology products and services to remain within that segment of super-tech users. Wearables are still having a tough time finding interest among a broad market, much less finding broad adoption. This TUPdate includes a complimentary brief summary of recent MetaFacts TUP (Technology User Profile) research results. These results are based on the most-recent results of the MetaFacts Technology User Profile 2016 survey, its 34th wave, with 7,334 respondents (US). Trend information is based on prior waves. For more information about MetaFacts and subscribing to TUP, please contact MetaFacts. Current TUP subscribers can tap into any of the following TUP information used for this analysis or for even deeper analysis. Numerous TUP sections feature analysis of spending plans. These include the Overview, Age Ranges, Age, Gender, Adoption Summary, PC Adoption, Mobile Phone Adoption, Adoption Years, Device Combinations, Primary and Secondary Devices, Devices OS Ecosystems, Brand Footprint, Key Devices, Key Devices/OS, Home-Family PCs, Recently Purchase PCs, Purchase Year, Tablets, Mobile Phones, Smartphone, Basic cell phone, Smartphone Data, Lines, Spending, Wearable Technology, Hearables/Listening, TVs, Music Players, and Social Networks sections.